How do I attract high income earners using Google Ads? 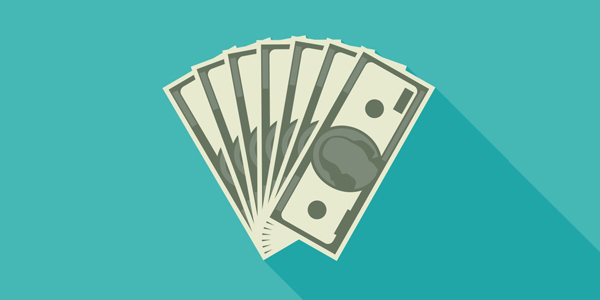 This is one of the most common questions we’re asked by our pay per click (PPC) clients: how do I get in front high income earners? Good question. How indeed does one grab the attention of the lawyers, doctors and directors of this world using Google and its paid ads service? Short answer? With difficulty. There is no one thing that will work on its own and you certainly shouldn’t be relying on keywords alone in order to garner the attention of prospective customers. Just as Google wants to return the most accurate and valuable answers to the queries we ask from it every day, Google Ads function in the same way. In the moment someone keys in a query on their keyboard, tablet or phone – Google ads are focussed entirely on that particular users interests. Why is it so difficult to attract the more affluent end of your target market? Targetting any audience is tricky at the best of times, whether high earners or not. Predicting what language your target audience is going to use is nigh on impossible. Yes, users interests are defined by the different things they have been searching for. But Google also takes into consideration other aspects of their online presence, like age, gender, occupation and location. Google Ads provides businesses and marketers with an arsenal of other functions that when correctly utilised, will allow you to target your ads with pin point accuracy. This is a particularly useful function when trying to target high earners. If we take into consideration that the majority of high salaries will be earned by people over 30, we would start by excluding the 18-24 year old age group. Whilst there may be some high earners within this age group, they will be few and far between, so this is a great starting point for narrowing your gaze. Location targeting in Google Ads doesn’t just allow you to focus your efforts on specific towns and cities, you can filter right down to a post code level. If your aim is to attract high income earners, you might want to start by excluding those postcodes that aren’t perhaps as affluent as you’re looking for. This copy will turn off or discourage people looking for a cheap suit, but encourage people who aspire to and can afford this price point. This particular feature might make you feel a little judgemental as it does encourage generalising a tad! But it is an extremely effective way of narrowing down your the potential reach for your ads. Use statuses like home ownership, education or a professional degree and whether or not they are a parent. You don’t know what you want but you do know what you don’t want, that old chestnut. Well negative keywords allow you to filter out exactly that, the audience you don’t want. Put simply, if you filter out those keywords synonymous with budget and value, those people searching for ‘red hot deals’ will not see your ads. Start with terms such as ‘cheap’, ‘affordable’ and ‘low cost’. 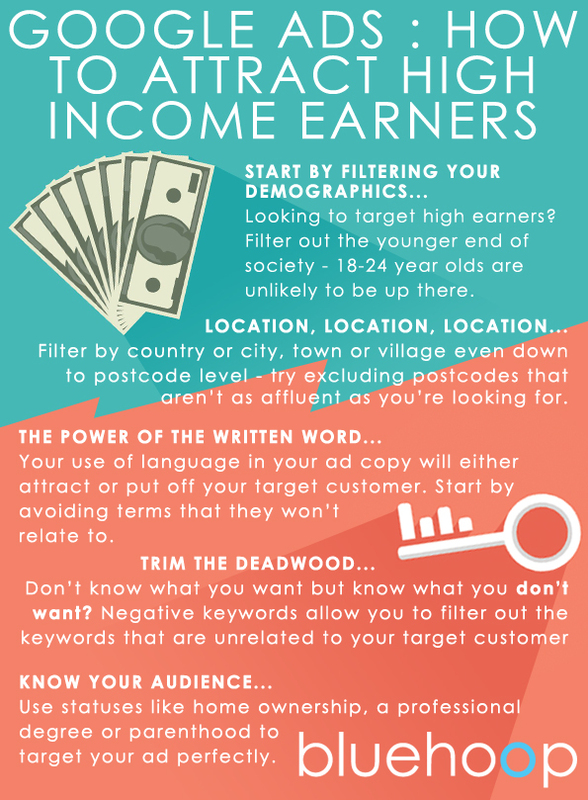 So there you have it, five simple ways to help your ads get in front of those high income earners. We manage ad accounts for multiple clients, tailoring their audience and demographics so that their ads get in front of the right people every time. If you need any advice or Google Ads management, get in touch and see how we can help.